Now in paperback, “a compelling, accessible, and provocative piece of work that forces us to question many of our assumptions” (Gillian Tett, author of Fool’s Gold). Quants, physicists working on Wall Street as quantitative analysts, have been widely blamed for triggering financial crises with their complex mathematical models. Their formulas were meant to allow Wall Street to prosper without risk. But in this penetrating insider’s look at the recent economic collapse, Emanuel Derman—former head quant at Goldman Sachs—explains the collision between mathematical modeling and economics and what makes financial models so dangerous. Though such models imitate the style of physics and employ the language of mathematics, theories in physics aim for a description of reality—but in finance, models can shoot only for a very limited approximation of reality. Derman uses his firsthand experience in financial theory and practice to explain the complicated tangles that have paralyzed the economy. Models.Behaving.Badly. 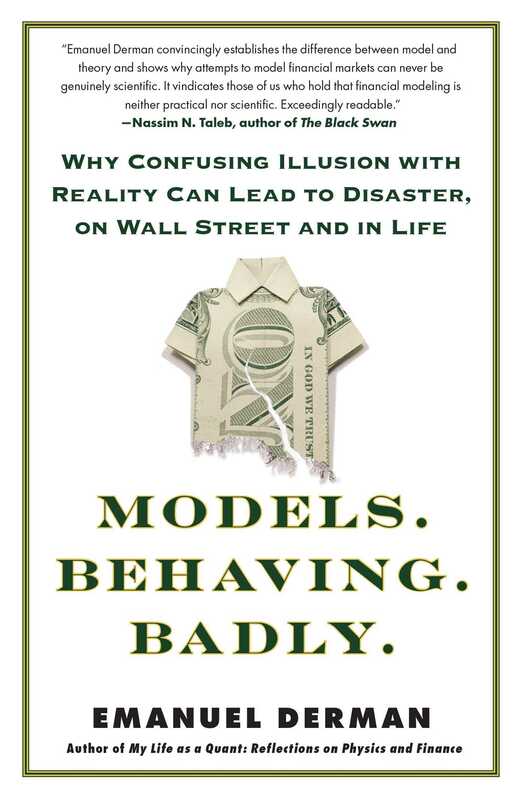 exposes Wall Street’s love affair with models, and shows us why nobody will ever be able to write a model that can encapsulate human behavior. EMANUEL DERMAN is Head of Risk at Prisma Capital Partners and a professor at Columbia University, where he directs their program in financial engineering. He is the author of My Life As A Quant, one of Business Week’s top ten books of the year, in which he introduced the quant world to a wide audience. He was born in South Africa but has lived most of his professional life in Manhattan in New York City, where he has made contributions to several fields. He started out as a theoretical physicist, doing research on unified theories of elementary particle interactions. At AT&T Bell Laboratories in the 1980s he developed programming languages for business modeling. From 1985 to 2002 he worked on Wall Street, running quantitative strategies research groups in fixed income, equities and risk management, and was appointed a managing director at Goldman Sachs & Co. in 1997. The financial models he developed there, the Black-Derman-Toy interest rate model and the Derman-Kani local volatility model, have become widely used industry standards. In his 1996 article Model Risk Derman pointed out the dangers that inevitably accompany the use of models, a theme he developed in My Life as a Quant. Among his many awards and honors, he was named the SunGard/IAFE Financial Engineer of the Year in 2000. He has a PhD in theoretical physics from Columbia University and is the author of numerous articles in elementary particle physics, computer science, and finance. Book Cover Image (jpg): Models.Behaving.Badly.